How’d this happen? It’s almost the end of November. Nanowrimoers are crossing the finish line. Those that haven’t yet know that the last two days are all about survival by any means necessary. Tracy McCusker has the fourth installment in her Nanowrimo comic series. If you’re just joining us, you can read the others here. 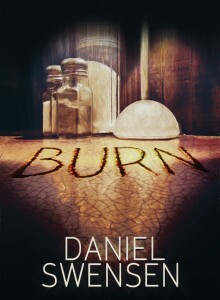 Get BURN on Smashwords for Free! For those of you interested in my fiction, my short story Burn is available on Smashwords right now, for the price of zero dollars. I figure, if you find out if you like my writing style, you can pick up the next one. Alexa Bernell can do what no one else can — or so she thought, until the Omen Project found her. Shaped by drugs and brutal training, she was their weapon. Until she got loose. Haunted by the memories of what she’s done, Alexa ran. Now the Project is hunting her. They’ve sent Cav, her friend, her lover, and her only confidant. If she wants to be free, she has to kill him. Cover art by the fine and talented Tracy McCusker. Thanks, and if you do pick it up, I hope you’ll leave a review! Tracy McCusker’s third installment in her Nanowrimo comic series. If you’re just joining us, you can read the others here. Tracy McCusker’s second installment in her Nanowrimo comic series. Check out her website and follow her on Twitter! Tracy McCusker of Dusty Journal has kindly offered to illustrate a comic for the month of November, highlighting the joys and trials of National Novel Writing Month. Check back for more installments throughout November. And! If you’re looking for an illustrator for your Nano novel, check out Tracy’s portfolio of awesome illustration work. She does terrific work at a great rate, and I say that as a happy client.